CELEBRATE WITH DANCE WITH MISS RACHEL! The sky’s the limit for birthday parties at Dance with Miss Rachel! 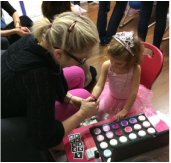 With custom themes such as Princesses & Superheroes, Disney, or Broadway (starring the birthday girl, of course! ), we’ll make it a birthday you’ll never forget. All parties include singing, dancing, and live piano music. Custom options including theme-based arts and crafts, face painting, glitter tattoos, and more available upon request. Multiple party packages available. Complete the form below for a quote! We are happy to work with you to address any special requests.